As I'm currently writing this blog post, I'm watching my two year old throw a really spectacular tantrum on the floor because I wouldn't let her color ... with a sharpie ... in her belly button. Man I wish my biggest problem of the day was my mommy not letting me draw in my belly button with a sharpie. Talk about life goals. Kids are fun. Way more fun than adults. This is why I love designing child bedrooms and nurseries so much. The designs can be weird, creative, imaginative, colorful, bold, simple -- the sky is the limit. Madilyn made the big transition from a crib to a toddler bed and now needed a "big girl' room to match. Her mom wanted a room that was feminine with an antique and vintage theme, but also a room that could transcend and grow with her daughter's age: nothing overly juvenile or childish. Pink had to be a big part of the room. Duh. But not barbie pink or unicorn vomit pink. Blush pink. Light, fluffy, pretty blush pink. Like many of the bedrooms I design, this one started to come together as soon as I found the curtain fabric. It set the color scheme - mint, blush, cream, and grey - and overall feel. Feminine, but not girly. Right? No neon, or primary colors, no Fisher Price toddler crap. No glitter, sparkles, or tiaras. The focal point of the room is the wall. Those boards are antique reclaimed wood. I saw a few pink boards at Old Texas Wood and begged them to find as many more as possible. As always, they came through. The pink boards are mixed in with some natural, wide plank boards, some weathered grey boards, and distressed white boards. I absolutely love the end result. I know how much my toddler loves seeing her name written down, so I wanted to make sure to incorporate Madilyn's name in the room design. The customized tall wood "I AM HIS" sign was created just for her by the Etsy store, Pretty in Polka Dots. I loved it so much I've already ordered a different piece from this store for another client. The vintage mirror above the bed came from another Etsy store, Flicker and Sway. Talk about good packaging! I almost needed a chainsaw to get through all that bubble wrap. I didn't want to take away from the beauty of the boards, but the walls were a plain light grey, almost cream color so we painted them Sherwin Williams "Sky High". It's a little bit bluish, a little bit minty and so so pretty. Where is that ridiculously cute beaded chandelier from? Well I'm glad you asked. You can find that little guy at Pottery Barn Kids. I also bought the soft sheer canopy from there. Madilyn already had a pretty awesome play room, so her mom wanted to keep most of the toys out of her bedroom. In place of a toy chest or desk area, we opted for a cozy little corner where she could cuddle up and read a book or play with her stuffed animals. I scored this pink little rocker and distressed mint tool box (now a floral display) from the Canton flea market. $25 for both. Um, yes. 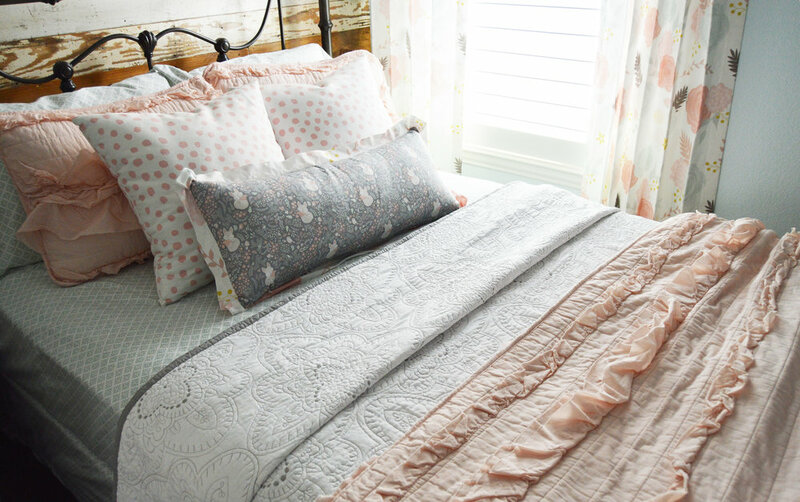 The sheets and white quilt are from Target and the pink coverlet and bed frame are from Wayfair. That really, really awesome rug? Lulu and Georgia. I had the pillows and drapes custom-made to create a cohesive and well-rounded pattern and color scheme with various textures and shapes. I searched and searched and searched for a nightstand that would be perfect. It couldn't be too fussy next to that wall, but it needed to have some charm and character. I finally found this little french provincial nightstand (and that black step stool) at a local antique furniture store. The original hardware was, well, ugly. So, I did something many of my colleagues may scoff at: I replaced antique hardware with Hobby Lobby hardware. Whaaaaaaaat?! The vintage pink Mary Kay telephone is from eBay and the little vase and flowers are from the great Ikea. The lamp and base are from Lamps Plus. They don't have that exact shade anymore, but I linked one that is pretty darn close. There you go. Hands down, one of my all-time favorite rooms to-date. Newer PostSophisticated and Feminine Nursery Reveal ... and Some Big News!